Back-Up Story: "Fear is a Baby's Cry!" Superman Prime, arriving on Earth, sees the memorial to Bart. Scoffing, he makes his tombstone read Bart Allen: The STUPIDEST BOY DEAD! instead of "The Flash." 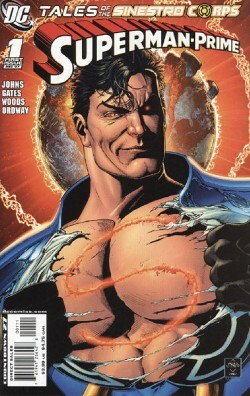 Superman Prime smashes through them, Flashes first, moving through the ranks, before heading to meet the sun and thus regain his powers, which have been diminished by a year in the Green Lantern cell. He recalls being young, dreaming of comic book heroes, and how much he enjoyed the sunrise. Battling east, he fights heroes until Wonder Girl grabs him after a failed attempt to down him by Firestorm with New Earth Kryptonite. Red Star attacks, weakening Superman and taking a piece of his armor. Risk appears, missing an arm from his last encounter with Superman Prime, and wants to take a piece. In response, Superman Prime rips off his other arm. Superman Prime recalls discovering his power, meeting Superman, and the Crisis, ending with his trip to "Heaven." Robin calls Krypto, who attacks Prime brutally, recalling the fight that ended in his master's death. Prime recalls the Infinite Crisis events, ending with his imprisonment and eventual release by Sinestro. Seeing the Anti-Monitor, Prime conceded his pride and was fitted with armor, realizing that after the keystone Earth, New Earth, fell, he could bend the Monitor to his will. Prime manages to get the better of Krypto, only to have Cyborg crash into him. Superman, Supergirl, and Power Girl have arrived. They proceed to beat Prime, who mocks Superman for needing help from girls. He calls Superman of Earth-2 a has-been, and Power Girl threatens to kill him. Superman persuades her to calm, and Superman Prime begins to cry, lamenting what he's lost, what he could have had, and how he feels forced into his position. Superman tells him that he feels sorry for his loss, but that his actions were inexcusable. Prime responds by burning heat vision through Superman's shoulder and out the other side. The rest of the superheroes arrive, finally removing all of Prime's armor, only to turn in horror to find that he's basked in sunlight, fully recharged. Oa unleashes Ion, who heads to clash with Prime as the Anti-Monitor looks on, ankle deep in water from the ocean. Lyssa Drak tells two Lanterns guarding her the story of a Sinestro Corp member who preys on the babies of Green Lanterns, seeing as the female of the two is pregnant with the male's child. Main Story - 5: Incredible from both a character and an action perspective. There's not much more you can ask for from a comic, and technically this is just a side story for a larger story at hand. Johns continues to amaze me. The bit with Risk was brutal, losing another arm. Very strong character development for Risk, despite his removal from the fray. The battle royale with the entire DCU was also well done, with many characters getting a fair shot in, many obscure characters, and all the while, the character builds in the background. Relation to the sun, how it reminds him of his innocence he's lost, Laurie, the universes gone. Frankly, by the time he's crying on the bridge, you feel for the poor little punk, no matter what he's done, and that, my friends, is character complexity. Add into that Anti-Monitor bits, Henshaw, a new Ion. Johns is at the top of his game and still batting .400. I have no fricking clue in the world why Countdown is getting emphasis and the Sinestro War almost passed me by until Cyborg Superman pulled me in. I see his natural progression with this, too, to multiple colored interstellar adversaries, and I can't wait to see Johns move Green Lantern into the fourth of the big three. That's exactly where he's taking this for me. There were two moments that irked me, but unlike most comics, there were counters to fix it. The first one being the repeat of the line, "I always get out!" which came off as cheesy and repetitive. The second being brief extrapolation through dialogue when Batman explains Prime's Achilles Heel of needing the sun. This is allayed multiple times by fine writing, but in dialogue, since I noticed, there are two great lines to knock those two back to the recesses of the mind. First, to Cassie: "What? Don't tell me you're still mad about him?! You lost a CLONE! I lost MY WHOLE WORLD!" Damned fine point, and one of sympathy. Also: "Mr. Henshaw?" So incredibly in character. He doesn't say "Cyborg?" He says, "Mr. Henshaw?" as a Leave it to Beaver, idealistic character would. It's so on it just made me titter. Beyond that, there's a major issue that could be taken with this issue, that being why the heck Prime didn't just go straight up, or why the heck didn't he have power before he reached Earth, considering he didn't teleport there, and he was in the atmosphere, where the sun would be visible. In fact, the error is so comical it's amazing I didn't see it until now. But you know what? That's because the writing was SO...DAMNED...GOOD. That's how you get suspension of disbelief. Make us care so much about the dilemma, the situation, and the dialogue that we don't care if it's implausible. I had the same issue when they went through the red sun in Infinite Crisis #7. Who cares? The stakes are so high, the drama so tight, you just don't care. Main Art - 5: A bit inconsistent at times because of artist shifts, but both artists are so good that you really don't care unless you're looking for it. The shift from idealized past to battle in present offers a nice pacing, a great cinematic vibe, and strength of continuity. The splash and battle scenes are taut and tense. The sunlight in the end is so beautiful you actually kind of feel refreshed, until you realize that's the Anti-Monitor standing in the harbor and Superman Prime is about to decimate the Earth. I'm particularly fond of the kiss between Superboy and Laurie before he leaves. It's just very melancholy. A fine piece of art. Back-Up Story - 5: A very strong, starkly frightening story for so few pages. Graphic in subject matter, but still compelling. Back-Up Art - 4: Given the subject matter, this could have been done Hostel style, or 80s horror style. One is overgory for the sake of overgore, the other is enough to make you cringe with fear but not blow out your receptors. There are a few plain backgrounds, but the characters are all distinctive and the action well conveyed. Cover Art - 3: There's something funky about this issue. Mostly, I think, it's the fact that this doesn't look at all like Superman Prime as I know him in the comics. The S, while more realistic to what one would carve into one's chest with a finger, doesn't match the one in the comic. Also, SuperBOY, who calls himself Superman because he's got delusions of grandeur (and that's a creative way to cover up the legal battle, I say), but in reality, he's still just a kid. This guy on the cover looks thirty-five. It's still very bold, so I can't totally fault it. For image alone, I'm going to ignore the way it totally ignores the character's continuity and meet it halfway. Before you call that harsh, imagine a beautifully rendered image of Supergirl where she has a crew cut. Is it beautiful? Yes. But is it the subject? No.